Kermit the Frog famously noted, “It’s not easy being green.” Here in Monterey County, we disagree. Strive to make your next meeting both inspiring and sustainable by considering these three easy tips without compromising quality. One of the easiest ways to decrease the carbon footprint of your next event is by choosing an eco-friendly venue. This ensures that sustainable practices are already in place. Meeting planners looking at Monterey County for the next event can rest assured that they will not have to forgo quality in order to protect the environment. Hotels throughout Monterey County have been persistent on reducing their carbon footprint in innovative ways. The LEED Certified Portola Hotel & Spa incorporates sustainable practices throughout its operations. From an Ozone laundry system to generating electricity onsite through cogeneration. The Portola Hotel & Spa is experienced in executing zero-waste conferences and meetings for groups up to 900 and is an active participant in the Monterey Regional Food Scrap and Composting program. The hotel is conveniently located in downtown Monterey and is within walking distance to many restaurants and activities. Likewise, Asilomar Conference Grounds in Pacific Grove has been making huge strides in becoming a green property. A Certified Green Business with the Monterey Bay Area Green Business Program, Asilomar Conference Grounds has converted all lighting to LED efficient systems and installed a state-of-the-art water recycling system that reclaims up to 75% of water used for housekeeping operations. A popular perk for meeting planners, Asilomar partners with Cynergreen to offer stainless steel water bottles for purchase ‘at cost’ with the option of adding custom meeting specific logos to the bottles. 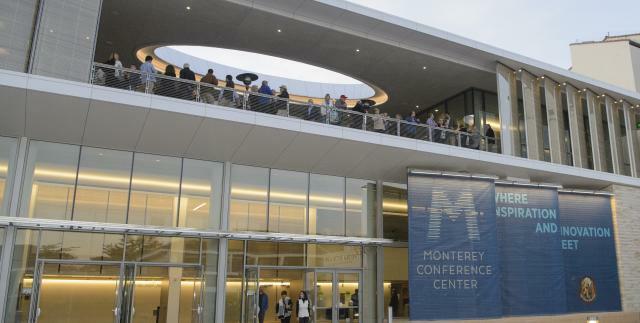 Additionally, the newly renovated Monterey Conference Center is in the process of becoming LEED Platinum Certified. When planning team building or spousal activities keep eco-friendly outdoor activities in mind. Not only will they boost event sustainability, but your attendees will surely enjoy the breath of fresh air. Luckily, the moderate climate in Monterey County allows for outdoor activities year-round. Segway Tours Monterey offers gliding tours of historic Monterey, the Monterey Bay Coastal Recreation Trail and scenic Pacific Grove. Segway Tours Monterey can travel up to 20 zero emission miles on a single charge and reduce traffic congestion on roads. They work with clients to customize group tours and also offer customized group scavenger hunts. Explore the wonders of the Monterey Bay National Marine Sanctuary by land or sea with Adventures by the Sea. The all-encompassing outfitter offers kayak, paddle board and bike rentals as well as custom tours and group team-building activities. Adventures by the Sea also offers group shuttle service from any hotel to their rental locations throughout the area, reducing traffic congestion and eliminating the hassle of parking. Incorporating volunteer teambuilding or a community service project can boost the moral and sustainability of your meeting or event. Our Strategic Client Services team can assist in connecting your group to local organizations that cover a wide range of opportunities including environmental beautification, social and community engagement and on-site assembly and donation. For more information and assistance on planning your next sustainable event, contact our MCCVB Sales Team at Sales@SeeMonterey.com or call 831-657-6426. Jessica is the Communications Specialist at the Monterey County Convention & Visitors Bureau. When not at work you’ll find Jessica at the beach with her dog Darlene.